Scholarly authors frequently reference a type of work that comprises a number of essays on a well-defined topic and that serves to introduce and/or summarize the state of the field of study at a given point in time. These works are often identified as handbooks or companions within the title, but not always. In some cases only the contents of the work offer a clue as to its nature. Several authors have expressed uncertainty about how to cite these standard works, so we decided to devote a post to citing them in a traditional (i.e., footnote; not author-date) citation system. For the most part, citations of handbooks, companions, and the like follow the pattern for other collections of essays written by various individuals (see SBLHS §6.2.12). 1. The footnote citation should identify the author and the title of the essay, the work in which the essay appears, and the specific page(s) being cited. 13. Carol Meyers, “Early Israel and the Rise of the Israelite Monarchy,” in The Blackwell Companion to the Hebrew Bible, ed. Leo G. Perdue (Oxford: Blackwell, 2001), 64–66. 21. Katharine J. Dell, “Wisdom,” in The Oxford Handbook of Biblical Studies, ed. J. W. Rogerson and Judith M. Lieu (Oxford: Oxford University Press, 2006), 415–16. 2. The bibliographical entry should include the same information but should format the entry as shown below and include the full page range of the essay. Meyers, Carol. “Early Israel and the Rise of the Israelite Monarchy.” Pages 61–86 in The Blackwell Companion to the Hebrew Bible. Edited by Leo G. Perdue. Oxford: Blackwell, 2001. Dell, Katharine J. “Wisdom.” Pages 409–19 in The Oxford Handbook of Biblical Studies. Edited by J. W. Rogerson and Judith M. Lieu. Oxford: Oxford University Press, 2006. 3. If the piece you are writing will not be accompanied by a bibliography, it is permissible but not necessary to include the full page range of the essay being cited in the footnote. 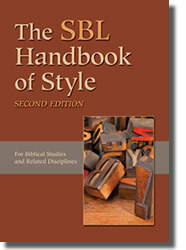 If you choose to do so, SBL Press prefers the second of the two options shown below. 13. Carol Meyers, “Early Israel and the Rise of the Israelite Monarchy,” in The Blackwell Companion to the Hebrew Bible, ed. Leo G. Perdue (Oxford: Blackwell, 2001), 64–66 (61–86). 13. Carol Meyers, “Early Israel and the Rise of the Israelite Monarchy,” in The Blackwell Companion to the Hebrew Bible, ed. Leo G. Perdue (Oxford: Blackwell, 2001), 61–86, here 64–66. 4. In footnotes, subsequent references to the same article should follow the guidelines presented here. Additional articles from the same volume should truncate the volume information, including only the editor’s last name, the short title of the volume, and the specific page(s) cited. 22. Philip Davies, “Qumran Studies,” in Rogerson and Lieu, Oxford Handbook of Biblical Studies, 99. Note that (1) one still includes the word in between the article title and the volume information; (2) the editor(s) name(s) come before the volume title; and (3) one does not include the abbreviation “ed(s).” after the editor(s). 5. In bibliographies, each article from the same volume should include the full information for the volume. Davies, Philip. “Qumran Studies.” Pages 99–107 in The Oxford Handbook of Biblical Studies. Edited by J. W. Rogerson and Judith M. Lieu. Oxford: Oxford University Press, 2006.